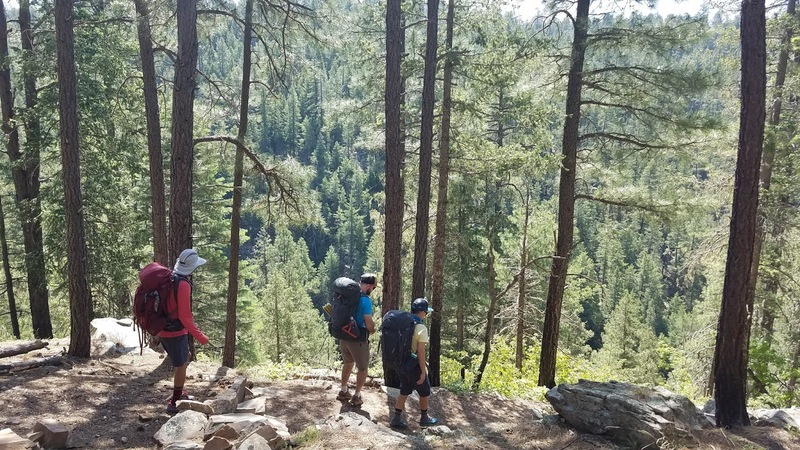 Backpacking with a good group is a great way to avoid temptation and enjoy nature! Getting out and having fun is good for everyone, but can be especially helpful for those in recovery from addiction. This post is from guest author, Michelle Peterson, who wishes to eliminate the stigma surrounding people who struggle with addiction. Her mission is aligned with that of RecoveryPride, which is to celebrate sobriety and those who achieve it. After a stretch of living sober, you’ve earned the right to treat yourself, and the best way to do that is with a vacation. A little bit of sunshine and fresh air will help you shake off some stress while enjoying the good things in life, but there’s just one little problem: temptation. Resorts are typically filled with people who came to party, hitting the beach with beers in hand and dancing all night at the local club. Don’t despair, though. There are ways of planning your getaway so that you stay clean while having more fun than the users and abusers. First, you need a place to go, and a lot of the traditional tourist hot spots revolve around alcohol. However, there’s a growing market for people like you who would rather enjoy their time away from work without a drink in their hand. Noticing this opportunity, travel companies have sprung up to meet this demand, and there’s no shortage of exciting destinations offered, including ski resorts, the tropics and even Alaska. And in the southwest, there are an incredible variety of areas where you can escape into nature’s beauty. Whether it’s the Grand Canyon or Canyon de Chelley, Zion National Park or Saguaro National Park, or dispersed campsites on the Mogollon Rim, there are plenty of ways to get outdoors, enjoy sobriety, and revel in the world’s beauty. You’ve got their back, and they’ve got yours. In fact, there just may be somebody from your rehabilitation center or 12-step program looking to get away as well. However, their sobriety is not the only feature you should be looking for in a fellow traveler. For starters, you should have some common interests; otherwise, you’ll never agree on what to do once you get there. Similar ideas about your budget will also prevent arguments while you’re on the road. You know the dangers of down time, so keep it to a minimum. That means planning exciting activities to do ahead of time to make sure you’re busy having fun rather than sitting around twiddling your thumbs. Instead of sitting around the visitor’s center at the South Rim, why not spend the day walking the rim trail, perusing the various historical sites, or even venturing down Bright Angel Trail if you have the fitness? Meanwhile, hiking and rock climbing are excellent options if you’re in in the mountains of Flagstaff or Denver; stand-up paddle boarding if you’re around any of the various lakes of Arizona; mountain biking around Prescott and Sedona…and all of these will keep you away from the bars and parties. There’s another reason you should step out of your comfort zone: It’ll help with your personal growth, and that’s just what you need when you’re in recovery. A bit of adventure teaches you to vanquish your fears, expand your mind and learn more about yourself. Moreover, the release of endorphins as you push your personal limits will give you a real high that makes a mockery of what you got from drugs and alcohol, and it’s all 100 percent healthy. While this may not seem directly related to sobriety, it is. Think about it. One of the greatest benefits of kicking your bad habits is all of the money that you save when you aren’t spending it all on drugs and alcohol. It’s worth protecting your newfound wealth by cutting some costs here and there without cutting any of the fun. The writers at Y Travel Blog recommend using free days to visit museums and talking to locals among their 52 tips on saving cash on the road. If your plans include air travel, CreditCards.com has a helpful article on getting deals on airfare, especially at the holidays. You do not want to be stressing about what’s going on back home while you’re traveling, as that could send you down the wrong path, so to speak. Before you leave, don’t forget to turn off the heating and central air, say the specialists at Bounce Energy. The thermostat is little more tricky. It should be raised to 85 degrees or turned off during the hot summer months, or lowered to 50 degrees in the winter to keep pipes from bursting. Appliances should all be unplugged. - Party destinations like Rocky Pointe, Las Vegas, or Lake Havasu City during spring break. - Places where you used to hang out while you were using. - Traveling with people who still drink or use drugs. - Hotels or hostels with a bar downstairs. - Noisy locales that’ll keep you awake at night. Now that you’ve found a destination and some cool people to go with, it’s time to get those tickets and prepare your packing list. Then ... bon voyage!